KIEV, Ukraine (AP) — Volodymyr Zelenskiy has spent more than 20 years as a comedian in Ukraine peppering his stand-up routines with imitations of politicians. 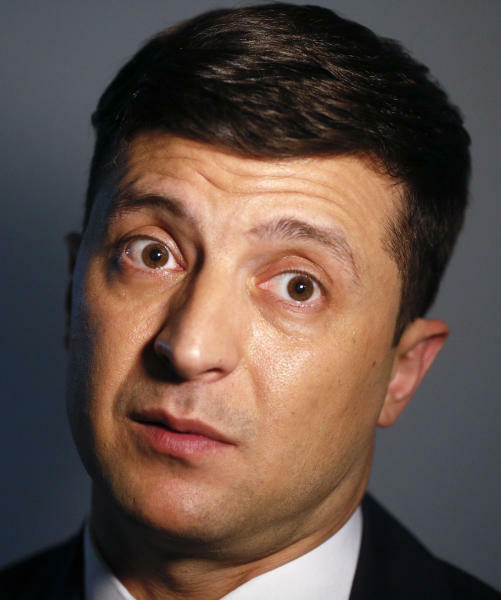 So when his production company needed an actor to play an everyman who unexpectedly becomes president, Zelenskiy was a clear choice. But in an example of life imitating art far more than the other way round, the 41-year-old film and TV star who plays the president in a popular TV series is the leading candidate in Ukraine's upcoming presidential election. It's a role he takes seriously. "Corruption is everywhere. We need to reduce its impact on the government, on people's lives," Zelenskiy said during an interview with The Associated Press in which he outlined plans to stem a population exodus with higher wages and to bring internet service to small villages. Zelenskiy argues that his lack of political experience is an advantage in an election climate in which voters have seen their hopes for a better future squashed. He described himself as a "fresh face" and allowed that his participation in the president's race gave some "hype" to Ukrainian politics. He also brushed aside claims that he's controlled by a powerful banker in a tug-of-war with the incumbent president, Petro Poroshenko. On "Servant of the People", the Ukrainian TV series he has starred in since the fall of 2015, Zelenskiy plays Vasyl Holoborodko, a high school teacher abruptly propelled into the presidency after a student's video of him blasting official corruption goes viral. The show is full of crude humor and four-letter words, but the inexperienced President Holoborodko is a good leader who honestly tries to serve the people. It's not clear to what extent the popularity of Zelenskiy's campaign is driven by his standing as a celebrity, or a collective longing for a figure like his character in the presidential seat amid strong public fatigue with the current political elite. In his stand-up routines, Zelenskiy frequently mocks the incumbent. The biting satire has boosted his popularity and irritated the president, who complained to the comic the portrayal was unfair, according to Zelenskiy's own account. With a laugh, Zelenskiy dismissed both Poroshenko and the other leading candidate, former Prime Minister Yulia Tymoshenko, as a "turned page." He voiced confidence in his ability to beat either in a runoff election between the top two finishers in the first round of voting. "People have grown tired of the old guard, so to say," he said. Recent opinion polls have shown Zelenskiy surging ahead of both Poroshenko and Tymoshenko in the run-up to the March 31 vote. An election survey by four respected polling agencies in Ukraine had 21.9 percent of respondents supporting Zelenskiy, the most of any candidate. Tymoshenko was the choice of 19.2 percent, and Poroshenko came in third with 14.8 percent. Thirty-four other 34 candidates trailed behind. The poll of 10,000 registered voters, done in face-to-face interviews, was completed last week and released Monday. It had a margin of error of 1 percentage point. "Zelenskiy has succeeded in attracting angry voters who have lost trust in the current politicians," said Viktor Zamyatin, an analyst with the Razumkov Center, a Kiev think tank. The comedian's rivals have tried to tarnish his newcomer's shine by pointing at his business ties to an expatriate billionaire banker and alleging that he controls Zelenskiy. The banker, Ihor Kolomoyskiy, left Ukraine following a clash with Poroshenko. Zelenskiy announced his candidacy on New Year's Eve on the TV channel that aired "Servant of the People" and is owned by Kolomoyskiy's media company. Other stations were broadcasting Poroshenko's New Year's address to the nation at the moment. 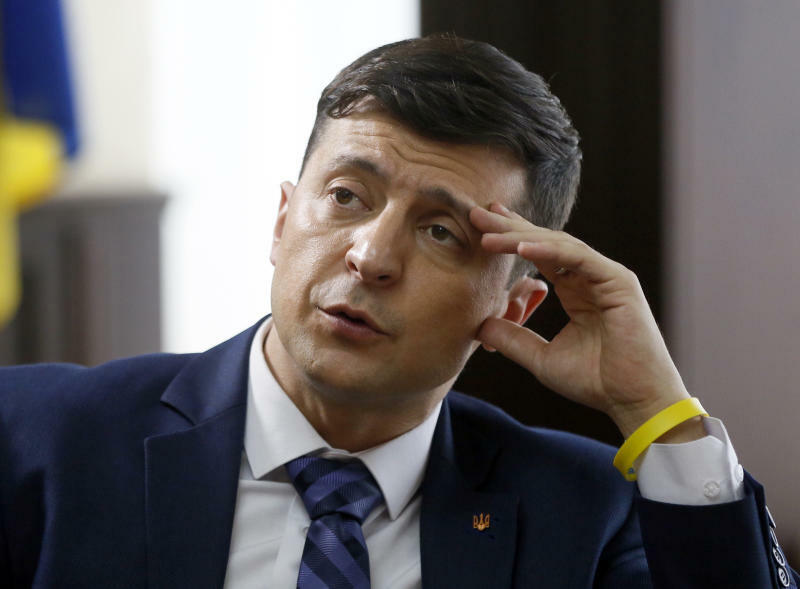 Zelenskiy has acknowledged business ties with Kolomoyskiy, but denied that he is the political patron directing his presidential bid. "There is nothing to talk about," he said. "I have no relation to him." Born to a professorial family in the industrial city of Kryvyi Rih when Ukraine still was part of the Soviet Union, Zelenskiy is a native Russian speaker, something that helps his popularity in eastern regions where many speak Russian. He started acting in law school and quickly became a standout on a popular TV show featuring competing comedy teams. In 2003, the team he led was turned into an entertainment production company, Kvartal 95. Zelenskiy's easygoing charm and quick wits were on display during the interview, which was conducted during a break in work on his TV series. "Servant of the People" has been a big success, with episodes streamed with English subtitles on Netflix and a spinoff movie. But the candidate also made it clear he isn't running for president in real life as a joke or publicity stunt. Depressed wages and public benefits have caused poverty and the flight of Ukrainians seeking better opportunities in European countries, he said. "We need competitive salaries for Ukrainians to feel self-respect," Zelenskiy said. Ukraine's economic troubles have led to a sharp decline in living standards since Russia's 2014 annexation of the Crimean Peninsula and a separatist insurgency in the east following the ouster of the country's Moscow-friendly president. 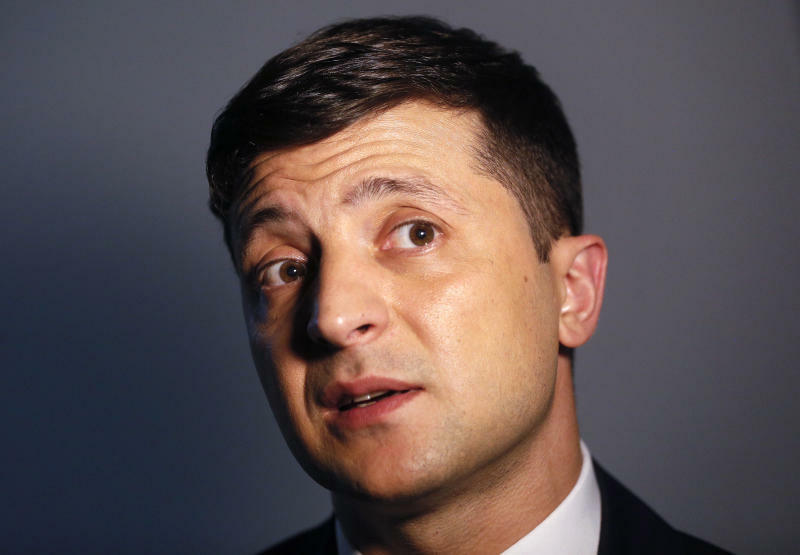 Zelenskiy described the continuing hostilities between pro-Russia separatists and Ukrainian forces in the eastern region of Donbass as the country's most pressing challenge. More than 10,000 people have been killed in the conflict, and the fighting has devastated the country's industrial heartland. "We are waiting for peace to come to Ukraine," he said. "It's the most horrible thing that people die." At the same time, he insisted that "we want and will return our territories, Crimea and Donbass." Zelenskiy said he would pursue Ukraine's aspirations to join the European Union, if he wins the election. He wouldn't say if he would press for the country's membership in NATO. "Ukraine has chosen its path," he said. "This is the European path, and I absolutely believe that it's the right one."